AnjularJs - One of the widely used Web Application Framework from Google, released last week. 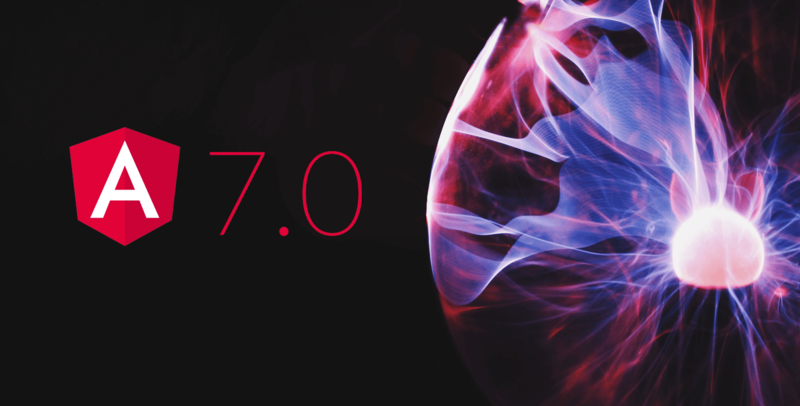 The latest Angular 7 release promises new and exciting updates that will further ease the application development. Well, we understand how constant degradation is mandatory to maintain the algorithm of the advancing trend. Most notably is a significant update to its "Component Development Kit", "Material Design with the new Virtual Scrolling", Drag and Drop components and Default Performance Budgets. Here are the features described in brief, to let you understand “how and why” you can opt Angular 7 web application development. One of the common features in contemporary web applications is scrolling lists. These are usually lists of dynamically loaded content. Generally, the Angular is used as an enterprise solution as it owes a large ecosystem and component-based architecture, thus the Virtual Scrolling is undoubtedly a key feature in the release. Must Read: Top 5 Reasons: Why Web Developers Should Use Angularjs Development? Let's understand what this Virtual Scrolling mean? Well, it is a technique that works through only displaying a consistent number of list items and storing more as the user scrolls down. This indicates that the browser can do less data rendering and present a faster user experience. Angular’s Virtual Scrolling presents this functionality out of the box, fine-tuned by Google’s Angular team. This allows the developers to apply this out-of-the-box functionality outwardly having to use third-party libraries especially to provide for this use case. Obviously, this is an impressive extension to Angular’s component kit. How the drag and drop are reflecting distinction. Generally, the drag-drop module presents you with a way to efficiently and declaratively build drag-and-drop interfaces, along with the support for open dragging, sorting within a list, and transferring items between lists. Further, it also facilitates animations, touch devices, custom drag handles, previews, and placeholders, an extension to horizontal lists and locking along an axis”. The new update in Angular 7 permits performance budgeting by default. And ensures developers to effortlessly alternate increase/reduce their memory budget by updating the angular.json file. Moreover, the Angular team in the official documentation states that “Budgets is a feature in the Angular CLI which allows you to set budget inceptions in your configuration to guarantee that parts of your application to be within boundaries. Many sectors like real estate, sports, transportation, health, and fitness industries, trust AngularJS platform for application development. Moreover, well-known brands across the globe like Amazon, Netflix, Forbes, LinkedIn and etc, are using this framework. And the AngularJS is the best application development platform to overcome the competition pertaining in the digital realm. All the above-mentioned perks will surely draw your attention to employ AngularJs Web application development framework for your next project for sure. Hire Angular developer from a leading AngularJS development company like Root Info Solutions - hold expertise in agile and Hybrid Front-End Application Development.